Defined benefit plans within the P&I 1,000 universe represented $6.91 trillion in assets, while defined contribution plans in the group accounted for nearly $4.1 trillion in assets as of Sept. 30. 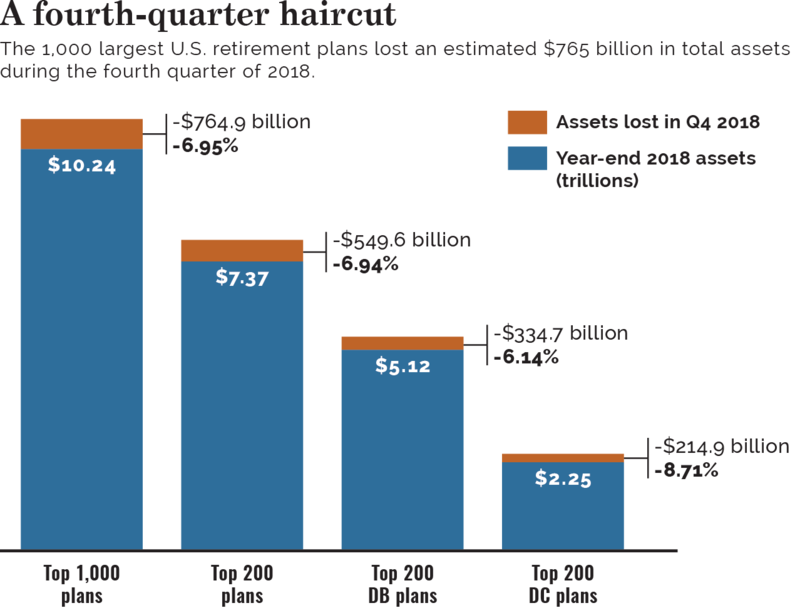 Among the 200 largest retirement systems, asset growth among defined contribution plans, which oversaw $2.47 trillion in assets, once again outpaced that of DB plans, with $5.46 trillion in assets, the survey found. Of note, assets of DB plans in the top 200 grew 4.4% compared to the previous year and 22.4% compared to five years earlier. Assets in the top 200 defined contribution plans grew 10.7% from a year earlier and 53.5% from five years earlier. The asset growth differences can be attributed to a number of factors, including DC plans "benefiting from market gains and new contributions," said Jay Love, an Atlanta-based partner and U.S. director of strategic research at investment consultant Mercer. "(Among) the top 1,000 DB plans, I would imagine that half of them are probably frozen and another 20% to 30% are closed," he added. For the 12 months ended Sept. 30, the Russell 3000 index was up 17.58%, while the MSCI ACWI IMI ex-U.S. index was up 1.79% and the Bloomberg Barclays U.S. Aggregate Bond index was down 1.2%. There was no change at the top as the three largest retirement plans by assets remained unchanged from last year. The Federal Retirement Thrift Savings Plan, Washington, retained its No. 1 spot with $578.8 billion in assets as of Sept. 30, up 8.9% from last year. Sacramento-based California Public Employees' Retirement System again ranked second with $376.9 billion, increasing 11.9% over the year, followed by the California State Teachers' Retirement System, West Sacramento, up 6.5% to $230.2 billion. The DB plans among the 200 largest showed an increased interest in domestic active equity and domestic active bonds, which respectively had $405.1 billion in assets, up 16.2% for the year, and $756.8 billion in assets, a 12.9% increase from the prior year. By comparison, assets invested in passively managed U.S. equities were up just 0.8% to $605.2 billion in the year ended Sept. 30. For overall passive indexed equity, assets increased 1.9% to $942.1 billion over the year, while assets in passive indexed bonds among these plans dropped 4.6% to $136 billion since Sept. 30, 2017. For DC plans among the 200 largest, passive indexed equity assets increased by 14.5% in the 12 months ended Sept. 30, to $538.8 billion, while passive indexed bond assets remained unchanged over the year, at $50.2 billion. DC plan clients in particular have recognized "that you don't want to be so dogmatic (when considering) active vs. passive" approaches in your portfolio, said Josh Cohen, Chicago-based head of institutional defined contribution at PGIM Inc. "We think there is a case for active and passive," depending on the asset class, Mr. Cohen said. With this in mind, very few institutional investors — whether DB or DC, non-profit or insurers — are going into passive fixed income, he added. "A lot of it has to do with the portfolio construction of the benchmark in fixed income," Mr. Cohen explained. "And, historically, managers' ability through thoughtful security selection and asset allocation (has allowed them) to outperform the benchmark," he said of concerns about passive fixed-income investments. Among the DB plans in the 200 largest systems, international active equity assets dropped 0.5% over the year ending Sept. 30, to $437.9 billion. Additionally, assets in active and indexed global equity fell 1.3% to $266.6 billion, while assets in active and indexed emerging markets dipped 5.9%, down to $191.5 billion as of Sept. 30. Across the entire P&I 1,000 universe, corporate DB plans saw their average allocation to domestic stock shrink to 16.4% of their total portfolio in 2018, down from 21.5% the previous year. The average allocation to international stock also dropped to 10.5% from 14.1% a year prior. Meanwhile, average allocations to global equity and domestic fixed income, respectively, increased to 9.3% and 43.5% of their total portfolio, up from 4.3% and 38.8%. Allocations at union plans among the top 1,000 did not significantly change over the year by asset class. More than half of their total portfolios continued to be allocated to domestic stock (26.7%) and domestic fixed income (28.3%), as of Sept. 30. Union plans had 27.8% allocated to domestic stock and 26.9% to domestic fixed income a year earlier. Public DB plans within the 1,000 largest retirement funds are seeing their allocations to alternative investments, private equity and real estate equity increase, the P&I survey found. In fact, on average, the percentage of public DB plans' total portfolio dedicated to private equity was 9.2%, up from 8.7% a year prior; real estate equity was 8.1%, up from 7.9% the year prior; and public DB plans' average allocation to other alternatives was 7.5%, up from 6.9% last year. Of note, DB plans in the top 200 saw assets in private equity, specifically, increase by 10.7% to $367.2 billion as of Sept. 30. For public DB plans in particular, "many of them do have deficits, and they need exposure to higher-return asset (classes)," said Michael Moran, chief pension strategist at Goldman Sachs Asset Management, New York. "That's a continuation of a trend we've seen in the past few years," he said about public DB plans increasing their allocations to alternatives. Among DB plans in the top 200, assets in hedge funds largely stayed the same, increasingly only 0.1% to $159.7 billion as of Sept. 30, according to the P&I survey. Increased volatility in the fourth quarter, however, might prompt some pension plans to see a bigger role for hedge funds in their portfolio in 2019, said Sona Menon, Boston-based head of North American pensions and outsourced CIO at Cambridge Associates LLC. "This gave an opportunity for hedge funds to have a little bit of a comeback … hedge funds showed that they can protect on the downside," Ms. Menon said. "Over the last several years, (pension plans have) dialed down their allocation to hedge funds, and some have even eliminated them, but the volatility (last quarter) may help plan sponsors to think about whether there is an increased role for alternatives in their portfolio." The fourth quarter "was one of the toughest quarters for the S&P 500, with one of the highest drawdowns since the financial crisis. In the fourth quarter, the S&P 500 index was down 13.5%," Ms. Menon added. P&I estimated that the 1,000 largest retirement plans lost $765 billion in total assets during the three-month period ended Dec. 31, a 7% decline from Sept. 30. Defined benefit plans fared better than their defined contribution counterparts, insulated by relatively higher allocations to fixed income. Among the 200 largest sponsors, DC plans held about half of their total assets in global equities, the bulk of which was in U.S. equities. Index data was used to estimate weighted average asset class returns for the three-month period ended Dec. 31. Internally managed assets among the defined benefit plans in the top 200 increased over both the 12-month period ended Sept. 30 as well as over the five-year period. Over the survey year, the top 200 plans' internally managed DB assets rose 7.5% to $1.3 trillion. The trend also has gained steam, as internally managed assets grew 31.2% from $987.7 billion over the five-year period ended Sept. 30. The move toward internal management shows that external active managers increasingly are having to demonstrate the value for the fees they charge clients, said Julian Lyne, the New York-based chief commercial officer for Newton Investment Management, a boutique asset manager that is a part of BNY Mellon Investment Management. "In certain asset classes, plans that have good resourcing can do (internal management) more effectively. In my experience, the allocation to external managers tends to be some of the more non-vanilla products and capabilities. I think it's about value for money, and in some areas, taking assets in-house is the right move," Mr. Lyne said. The P&I survey found that DB plans in the top 200 internally managed $516.7 billion in domestic equity (active and indexed), up 14.2% from the prior year; $416.4 billion in domestic fixed income (active and indexed), up 23.5%; and $158.2 billion invested in active and indexed international equity, up just 1% from the year prior. In contrast, internally managed assets in active and indexed global equity, and international fixed income noticeably declined, respectively dropping 37.2% to $58.2 billion and 26.5% to $19.1 billion. The 10 largest retirement plans remained the same this year, with three plans changing positions. Assets in AT&T Inc.'s DB and DC retirement plans increased 9.3% over the year to $124.1 billion in total assets, putting the corporate plan in the No. 8 spot, up from No. 10 last year. AT&T's retirement assets were boosted by its June acquisition or Time Warner Inc., which was estimated to have $7.2 billion across its defined benefit and defined contribution plans as of Sept. 30, 2017, and ranked No. 284 last year, according to P&I data. In the shift, Boeing Co., which had $123.7 billion in assets across its DB and DC plans, up 1.6% from the prior year, dropped one spot to No. 9 on the list, while the New York State Teachers' Retirement System, Albany, also dropped one spot to No. 10 on the list, with $120.1 billion in defined benefit assets, a 3.8% increase from the previous year. Separately, this year, P&I included for the first time in its survey a question for DB plans asking if their fund incorporated environmental, social and governance factors into their portfolio management process. The number of funds in the top 200 that responded "no" to the ESG question was 46, while 18 funds said they were using ESG factors, the survey revealed. Not all plan sponsors responded to the question. Also, among defined benefit plans in the top 200, assets in factor-based equity increased 86.4% to $38.4 billion from $20.6 billion the previous year, led by CalPERS increasing its exposure by 52% to $19 billion. Charles McGrath contributed to this article.